This didn’t look anything like Gonzaga’s first eight games of the season. Or its last four victories against cross-state rival Washington. But it was still effective. The Zags’ high-powered offense wasn’t firing on all cylinders, but the Bulldogs rode another big night from Rui Hachimura – that did look familiar – to an 81-79 victory over the Huskies in front of 6,000 Wednesday night at the McCarthey Athletic Center. Washington rallied from an 11-point second-half deficit to tie the score at 79 on Jaylen Nowell’s two free throws with 9.4 seconds remaining. Gonzaga had two shaky possessions in the final minute, but point guard Josh Perkins floated a pass to Hachimura, who buried a 15-footer with less than 1 second remaining for the winner. Washington tossed an inbound pass to Dominic Green, but his half-court shot was well short as the buzzer sounded. Hachimura finished with 26 points. The student section chanted his name as the 6-foot-8 junior forward was waiting for a postgame interview with ESPN’s Bill Walton and Dave Pasch. It was the closest game in the series since Washington’s 99-95 win in 2005 in Seattle. Since then, GU captured the previous four by 20, 16, 27 and 27 points. UW made a valiant effort at its first win in Spokane since 1944. The top-ranked Zags (9-0) have been putting up nearly 100 points per game. They’ve had just one game shooting below 52 percent – and that was a 49.2-percent effort against Texas A&M. They hit 42.9 percent against the Huskies. 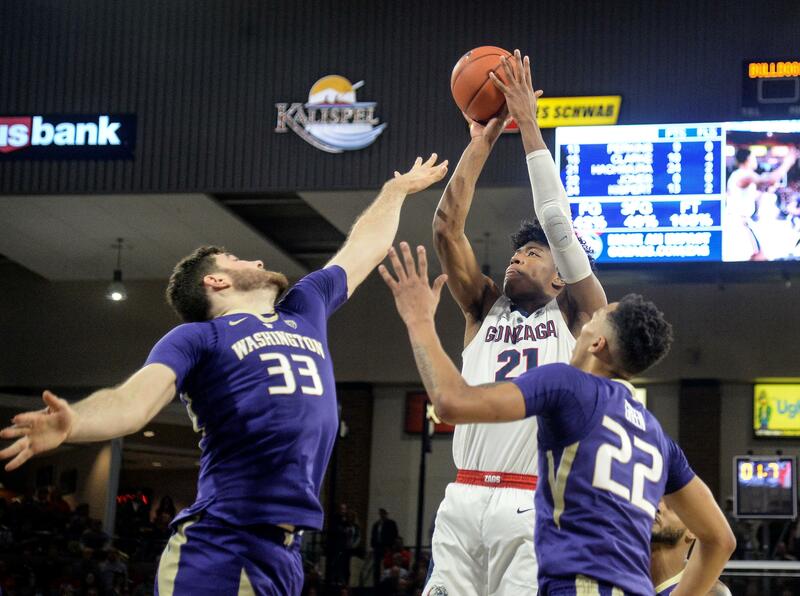 Washington’s zone defense didn’t stifle Gonzaga’s offense, but it did force the Zags to earn every field goal and it sidelined their running game for the most part. Gonzaga was hitting at a 35-percent clip with 5 minutes left in the first half but still led 29-19 because of its defense and its ability to capitalize on Washington’s turnovers. The Zags also cashed in on Washington’s foul trouble. They fed Hachimura repeatedly and he delivered a hard-earned 18 points in the opening half, including 6 of 6 at the free-throw line. Hachimura had a couple of shots swatted, but he kept taking it at UW’s big men, leaving frontcourt players Noah Dickerson, Sam Timmins and Hameir Wright with eight combined fouls. Meanwhile, the Huskies’ offense was stuck in neutral. Nowell had several smooth drives and a pull-up jumper, but it took Matisse Thybulle’s two 3-pointers and another by Green to trim GU’s 29-15 lead to 31-25. The Zags closed the half with a 9-5 run to take a 40-30 lead. Washington took the lead 45-42 with a 15-2 spurt to open the second half. Wright hit a 3-pointer and Nowell added two more 3s, the latter giving Washington the lead with 16 minutes remaining. Gonzaga misfired on several shots from 5 feet or closer before reserve forward Filip Petrusev scored inside and drew the third foul on Dickerson. Petrusev added another bucket to give the Zags the lead and Hachimura added a putback. The Zags never trailed again. They rebuilt their lead to 73-62 with 5:23 remaining after Brandon Clarke scored twice inside and Corey Kispert and Perkins each hit 3-pointers. Washington made another charge as Nowell, who scored 26 points, scored in the paint and Thybulle dunked in transition, cutting GU’s lead to 79-77. Nowell tied it with a pair of free throws, setting up Hachimura’s last-second heroics. The Zags face No. 7 Tennessee in Phoenix on Sunday. Published: Dec. 5, 2018, 10:38 p.m. Updated: Dec. 20, 2018, 5:33 p.m.